地獄・Hell was made for the "A Game By Its Cover 2017" jam in September 2017, based on a Famicart cover designed by TAGUCHI RYO. Time it right and crack the egg! If you miss, it'll turn into a chick, so time it right and give it food! When it grows up and lays an egg, time it right and crack the egg! Crack the egg, and if you fry it up, time it right and eat up! If you couldn't fry it up, you will be sent to hell. 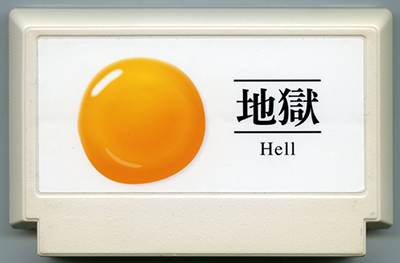 地獄・Hell is a game about cooking, rebirth, and punishment. It was made using PicoLove, a reimplementation of the PICO-8 fantasy console in the Love2D engine. Brilliant game! The sound and music were especially amazing, and I love the ending. I'm super happy that Joseph found this fantastic game in the A Game By Its Cover 2017 jam and wrote his article about it, because it's the most interesting one of it all in my eyes. I don't think that it feels odd just for the sake of oddity, but that it really has a kind of 'religious atmosphere'. The whole gameplay changes don't feel rash, but instead well planned, like it would represent something special. I don't say that I'd be able to interpret it correctly or that I did saw through it, but I see something in it that other games don't have. That's why I included it in our GOTY 2017 list. Congratulations for that! It's a wonderfully looking game with an own aura. <3 I hope others might see it with my eyes, that's why we also made a little gameplay video of it. Looking forward to your future projects! This changed and reset my life. My brain has become Egg... I'm going to call my grandma and buy at least 15 chickens because of this game. My grandma is dead. That was absolutely amazing. Playing through it, it seems nonsensical, but at the end you see how it all fit together. (Sort of, I mean it's still nuts) I actually got the good ending. I think. The graphics and animations are great; I also loved how there were enough hints to push you along through the game. I was also very amused by how each of the sins were implemented in the game. Great job! I dont know if anything lies beyond the layed egg but I love it very much. Nice game you made people, I saw a bunch of deep thoughts and meaningful messages in the game, but I kinda lost them in the end :D It was a very funny and bizzarre experience, totally worth it though!